Zhou Yu draws an extra card in his drawing phase. 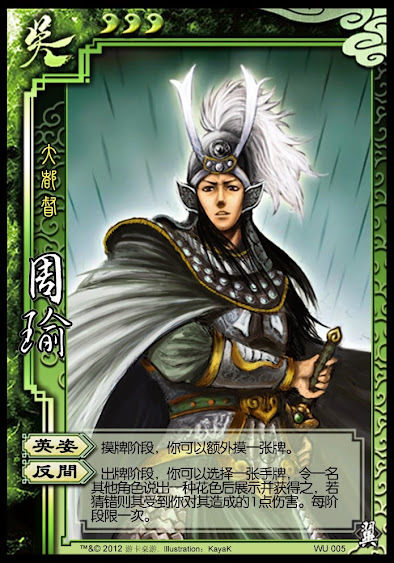 Once per turn, Zhou Yu puts a hand card face down and asks any other player what suit it is. The card is then flipped over. If the target guess incorrectly, Zhou Yu damages them one. Either way, they keep the card. "Brave Gesture" is the same as it was with the normal Zhou Yu. 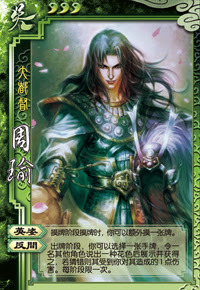 "Sow Revolt" has been modified slightly, but only to the point where Zhou Yu gets to pick the card.